Fruits and Vegetables are by far the best food you can eat. In their natural and intended form they are full of nutrients and energy that the human body was designed to consume. Sadly, what is labeled as fruit and vegetables these days leaves much to be desired. Besides the canned, jarred, dried, sweetened, and overly processed products; much of what you find in the produce section at your local grocery store is far from what nature intended. Commercial produce is laden with toxic fertilizers, pesticides, and other chemicals such as petroleum waxes all in the name of making it look “fresh” when it isn’t. I won’t go into details about Processed Food or Organic Food here, but please visit those pages to learn more. You might be surprised at what you find. Understanding what you are putting into your body will make a huge difference in your overall health. Treat your body like the masterpiece it is and only feed it quality whole foods. Fruit is nature’s little treats in my eyes. They should not make up a large part of your diet due to the simple carbohydrate content (1 serving per day), but they are highly nutritious. Instead of eating pastries and chocolate, try fruit. It’s nature’s cookie jar so to speak. It is difficult to classify fruits. Botanically speaking they share with some “vegetables” and there is some debate about what should be considered a fruit. I’ve stuck to the basics of common fruit as we see it. Keep in mind that nuts, seeds, grains, and legumes are technically “dry fruits”, but are not shown here (see the Grains, Legumes, Nuts & Seeds page). Berry: Single fleshy fruit (without a stone), usually containing multiple seeds. Drupe: Single fleshy fruit with a hard stone containing a single seed. Hesperidium: A berry with a tough, aromatic, citrusy rind. Fleshy Aggregate Fruit (Polydrupe): Multiple Drupes formed from a single flower, each containing one seed. Pseudocarp: Seeds contained on the outside of a fleshy fruit. Fleshy Multiple Fruit: Fleshy fruit formed from a group of flowers. Vegetables are the cornerstone for a healthy diet. They should make up the majority of your diet, and there are so many to choose from the options are limitless. With a little understanding and creativity you can learn to enjoy vegetables (see the Recipes page for ideas). Without them, you will certainly face illness in every aspect of your life: physical, mental, and emotional. Leafy Greens are probably the best food you can eat. They provide fiber, are full of vitamins, minerals, and nutrients that we require for good health. I try to incorporate these into at least one meal a day. There are many more leafy greens available than Iceberg lettuce and Spinach, so get creative and try some new things. You can use them for salads, as a steamed or sautéed vegetable, mixed in with one pot dishes, or as a wrap! Stalk Vegetables are the most common veggies we consume such as broccoli and cauliflower. They provide a good source of carbohydrates and cellulose for good digestion. They don’t have to be boring side dishes steamed with no flavor. Spice them up, slice them differently, or puree them and see the many variations you can come up with. Root Vegetables are the comfort foods of our culture. They are potatoes (which are actually nightshades), sweet potatoes, carrots, turnips, beets, etc… While some are much better for you than others, they are all starchy vegetables and should be used with caution and as a rare treat rather than incorporated into daily diet. Fruit Vegetables are those that grow on a vine. These include tomatoes, eggplant, peppers, squashes, and legumes. These vary in their nutritional qualities (see the breakdown in families below). Generally speaking squashes are great fruit vegetables to eat regularly, although the winter squashes tend to be higher in starchy carbohydrate content and should be used sparingly and with caution. Tomatoes, eggplant, and peppers fall into the nightshade family which has its own cautions associated with it (see below). Peas and Beans are Legumes. Legumes fall into a completely separate family and should be used with caution or avoided altogether (see the Grains, Legumes, Nuts & Seeds page). Grass/Grain Vegetables are those that make up the bulk of our cultural diet. This includes rice, corn, and other grains. This tends to be our main source of carbohydrates, but realistically causes much of the nutritional deficiencies and ailments that we face (see the Grains, Legumes, Nuts & Seeds page). The only “grass” I would consider to have significant health benefits would be wheatgrass when it is juiced, although many people have allergies to it. Sea Vegetables are perhaps one of the least used, least understood, and most valuable additions to our diets. They are a primary vegetable in the plant kingdom, and contain many nutrients, vitamins, and minerals crucial to life. If there is one new thing to add to your diet, I would add this. The only caution I would give is to research how to prepare it and cook with it to avoid overpowering your dish with a briny taste (I learned this the hard way! In order to help you understand fruits and vegetables a little better, I’ve broken them down into the different families they fall into. This is not all-inclusive, but the most common. This helps to give you an idea of the relationship between different plants. If you plan on growing your own, these are the different families to plant separately. Some are better for you than others. Some should be used with caution. And some may need to be avoided completely depending on the person. Description: Vibrant wide leaves, some root vegetables, and some of the better grains. Caution: Please see the Grains, Legumes, Nuts & Seeds page for more details. Description: Root vegetables or Bell shaped dome vegetables with feathery often aromatic shoots. The bottom portion is used as a “vegetable” in cooking; while the shoots are used as herbs (see the Seasonings page for more details). Common Edibles: Aniseed, Caraway, Carrot, Cilantro, Coriander, Cumin, Celery, Chervil, Dill, Fennel, Parsley, Parsnip. Description: Flowers tend to be large and made up of many smaller flowers. This family can range from leafy greens to root vegetables to seeds. Leaves are often bitter. Common Edibles: Artichoke, Chamomile, Chicory, Dandelion, Endive, Escarole, Lettuce, Safflower, Sunflower, Sunchoke, Tarragon. Description: Leaf and Stalk vegetables belong to this family. Some less starchy root vegetables belong to this family as well. This is where most of our vegetables come from. Common Edibles: Arugula, Bok Choy, Cabbage, Cauliflower, Collard Greens, Broccoli, Brussel Sprouts, Horseradish, Kale, Kholrabi, Mustard (Greens and Seeds), Radish, Rutabega, Turnip, Wasabi, Watercress. Description: Fruit Vegetable on vines that sprawl and grow on the ground. Common Edibles: Cucumber, Melon (all varieties): Cantaloupe, Honeydew, Watermelon, etc. ; Squash (all varieties): Acorn Squash, Butternut Squash, Delicatta Squash, Yellow Squash, Pumpkin, Spaghetti Squash, Zucchini, etc. Description: Fruit vegetables, edible seeds, or legumes grown in pods. Common Edibles: Black Beans, Fenugreek, Green Beans, Kidney Beans, Lentils, Peanuts, Peas, all varieties of legumes. Description: These are aromatic herbs (see the Seasonings page for more details). Common Edibles: Basil, Catnip, Horehound, Hyssop, Lavender, Lemon Balm, Marjoram, Mint, Oregano, Rosemary, Savory, Sage, Thyme. Description: Bulb plants with long hollow leaves. The alliums are used as herbs in cooking (see the Seasonings page for more details). Common Edibles: Asparagus, Chive, Garlic, Leek, Onion, Scallion, Shallot. Description: Seeds of grass plants (grains). Description: Medium-sized family of flowering plants. Common Edibles: Almond, Apple, Apricot, Cherry, Peach, Pear, Raspberry, Plum, Strawberry. Description: Often have toxic leaves or berries. Only the tuber or fruit is usually edible. Caution: Nightshades are known to cause problems with arthritis, so caution should be used. If problems or symptoms occur, eliminate these from your diet (See the Anti-Nutrients page). Description: Other common vegetables that do not fall into the main family categories. Description: These are not technically vegetables, but we often treat them as such in food & nutrition, so I felt it was important to list them. Common Edibles: Button Mushrooms, Crimini Mushrooms, Oyster Mushrooms, Portabella Mushrooms. Caution: Please see the Elimination Diet page. Description: Sea Vegetables are in a category all of their own and are high in nutrients and minerals, particularly Iodine and Selenium. They are broken down into red algae, green algae, and brown algae. Common Edibles: Agar agar (used as a thickening agent), Arame, Coraline, Dulse, Hijiki, Kombu, Nori, Wakame. 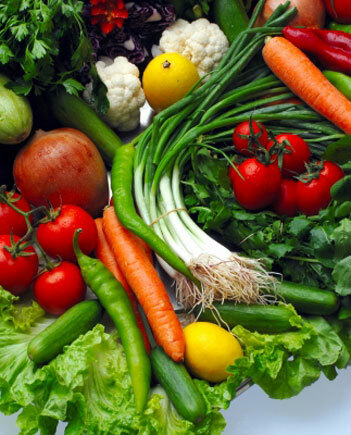 Fruits and Vegetables are the most important source of nutrients.